With construction resuming on the Las Colinas Area's Personal Transit System (APT), service will again be provided by DART shuttle buses, this time for an estimated five weeks beginning Monday, Nov. 20, 2017. Note: due to the Thanksgiving holiday, the shuttle will not operate Thursday, Nov. 23 or Friday, Nov. 24. 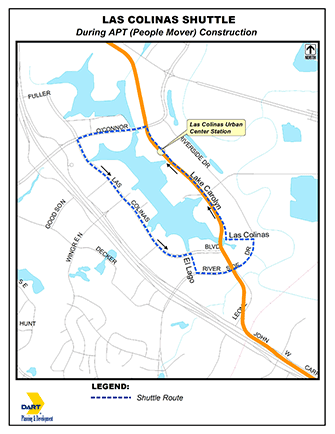 As during the initial shutdown earlier this year, buses will serve the Orange Line's Las Colinas Urban Center Station and operate in a counter-clockwise loop over Lake Carolyn Parkway, Riverside, Las Colinas Boulevard and O'Connor Boulevard. Hours of operation will be 6:00 a.m. to 6:00 p.m. on weekdays.